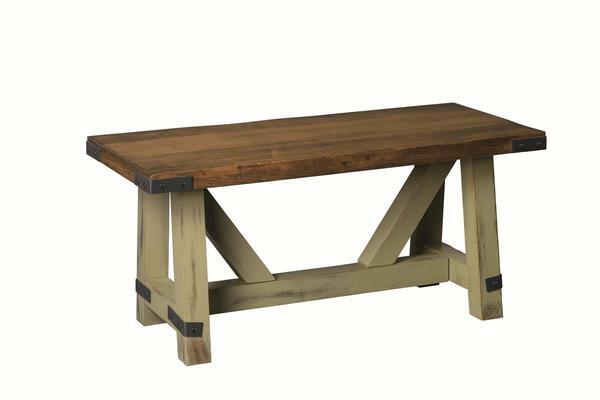 You might not want anyone's feet up on the Amish Olde Farmstead Cocktail Coffee Table, but rest assured this solid wood accent table can handle it. The Olde Farmstead features rustic style beams in the base and hand hammered steel bands, combining wood and steel in a warm and welcoming way. To Distress or Not to Distress? Light to heavy distressing is available for this coffee table. Woodworkers use special tools to create signs of wear for a worn and antique look. We've put together a video and blog on distressing techniques that you might enjoy. You've found the connection to quality heirloom furniture at DutchCrafters. All solid wood made by hand. We thank you for shopping with us and encourage you to contact us via email or phone with any questions.